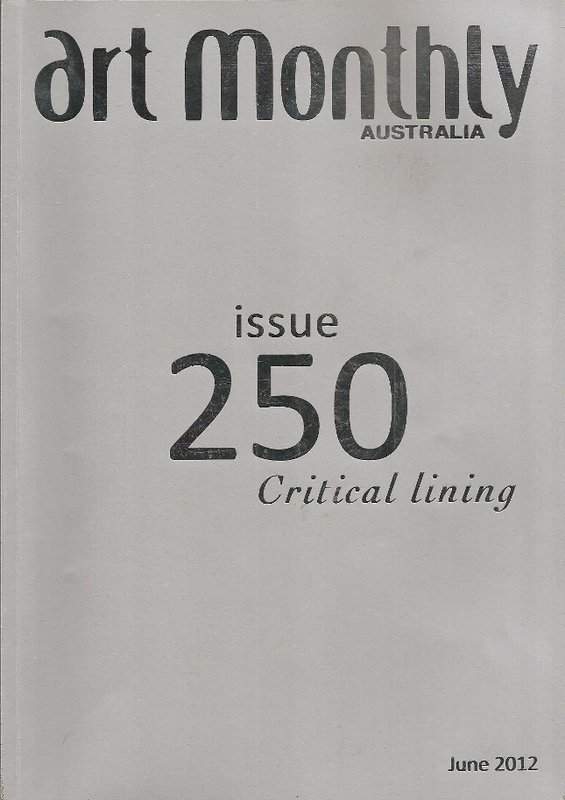 June 2012 was the 250th issue of Art Monthly Australia and I was one of a number of writers commissioned to celebrate the occasion by writing about “critical art writing”. My article, which became the lead, was not exactly reverential in tone, in fact I took a fair amount of delight in rubbing in the fact that capital A art is finally dissolving away into a broader culture of everyday life, something I had fought for all my life but which has some very threatening implications for the conventional art world. The version below is slightly different to the published version because it has some links and a number of minor amendments that never made it into print. 250 issues eh? Well, I’m delighted to congratulate Art Monthly and all who sailed in it and acknowledge its achievements and longevity, an achievement in itself. But the congratulations are tempered by the fact that like so many art world achievements, it all occurred within the art world’s sheltered workshop in the name of a meme – capital A art – that has been slowly dissolving away for almost forty years or more, yet Art Monthly, and admittedly most other art magazines as well, seems hardly to have noticed. When Art has dissolved away completely will there be any reason for art critical writing to exist? Well, we’ll get to that later but let’s step out of the art world echo chamber and examine what has been happening from the outside. In case you don’t know, I have a dog in this fight. It seemed fairly obvious to me back in the early 1970s that the historic moment called Art was over. Duchamp had demolished the art work as a special category of artefact by demonstrating that anything could be declared an art work and conceptual art had finished it off by removing the need for it to even have a physical existence. It seemed obvious to me that if anything could be art then nothing was art really and what remained were the various institutions and ideological beliefs that had built up around the art meme which the various players manipulated to suit their own purposes. What also remained was the bedrock human activity of constant cultural evolution and adaptation to changing circumstance, unconnected to any particular media, discipline, training or social class, and that was what interested me. I began to see the cultural innovators as artists despite their lack of either art context or intent, and I began to see the art world’s “artists” as artisan manufacturers working to an existing formula. As a result the two activities that began to interest me the most were the Builders Labourers Federation and the Green Ban movement on one hand and the innovative agriculturalist P A Yeomans on the other. They represented what I was seeking, an innovative art made out of everyday life, created by social interaction and with real world consequences. This also led to my involvement in the trade union movement, historically one of the main generators of traditional Australian cultural values. I had no doubt there were many others around the world with similar perceptions but by the eighties the art world institutions had begun their fight back against the radicalism of conceptualism, a return to order that locked out those of us who had espoused a wider definition of art. It wasn’t until the advent of the internet in the 1990s that we even began to find each other again. Now let’s talk about the official art world. Art Monthly was born in the middle of a period that really began around forty years ago. The social upheavals and cultural questioning that characterised the 1970s disguised something else that was happening, the transformation of the institutional art world – the Australian version of this has been documented and analysed by Dr Anne Sanders in recent papers. Driven by population growth and increased public funding, these institutions – art schools, museums, funding bodies and quangos like the biennales – were consolidating and growing. As always the art world simply mirrors the spirit of its time and the art world that had developed by the 1980s was the art world that the rising neo-liberal consensus had to have, a corporatised art world with the market at its core. And although this neo-liberal takeover centred on the US and Europe, Australia eagerly and unthinkingly tagged along, true to its unquenchable colonial spirit. As the number of private and public galleries grew so did the volume of art production in all forms, and the number of professional (or at least aspiring professional) artists. Modernism had tacitly maintained that art’s collectibility was an outcome of its intellectual significance but this uneasy balancing act collapsed as art became a medium for pure financial speculation. Museums succumbed to a similar syndrome, their role shifting from recording and presenting history to something more entrepreneurial. Curators started to manufacture momentary art movements and by strategic use of funding and publicity they positioned the museum as a booster of market value. Curators and collectors were no longer the sweepers trailing along behind the circus elephants, they were to lead the parade. Biennales also proliferated, joining the Olympics as a sort of marauding cultural predator that arrived every few years to take a bite out of the local culture. The biennales’ Disneyland version of culture as entertainment fostered an arms race of increasingly outlandish and sensational large scale art. Like Hollywood films, the product was preferably glitzy, a bit topical, a bit shocking, but always fundamentally inconsequential. Cities requiring a more heavy duty fix began to build venue museums by starchitects like Gehry, Hadid, Liebeskind, etc. and as time wore on the biennale entertainment model mated with the venue museum model to generate high profile private museums like MONA. Don’t be surprised when the venue museums, biennales and private museums are eventually sold off to the multi-national media and entertainment conglomerates like Disney or Fox, it will be the natural fulfilment of their art as entertainment approach. And the art of the period? By the early 1980s it had become clear that conceptualism, rather than being a threat to the existing order could be moulded into the ideal institutional form of art. The first wave of appropriation was more a marketing movement than an art movement and rebadging painting as “conceptual painting” provided a means of inflating the value of derivative art, increasingly necessary as the growing market required more product than was readily available. The second wave of appropriation, where it became the building block of most institutional conceptual art, was the art world’s equivalent to moving production to China. Just as the Fordist production line facilitated mass production by unskilled labour, so institutional conceptual art facilitated the mass production of art by artists whose primary skill was the ability to re-present other human activities in a form novel enough to keep the fashion cycle turning over. And art critical writing? Nothing critical about it. During the whole forty year period art writing rarely deviated from its basic purpose, product review and the promotion of art as the most posh form of life decoration. In the 1970s most art writing took the form of newspaper reviews but despite determined attempts to give some intellectual depth to this genre (particularly by Donald Brook) the quality of newspaper reviewing remained low and the quantity declined as editors increasingly took the view that it was really just advertorial and why give advertorial to an industry that wouldn’t pay its way with advertising. On the other hand cheaper offset printing encouraged a growth in magazines through the 80s so art writing proliferated there, partly because there was more product needing to be publicised, partly because the educational institutions were churning out graduates who had to do something for a few years until they finally found work in a less marginal industry. The takeover of art education by the universities also encouraged the Moment of Theory which many of these magazines participated in until it collapsed under the weight of its own verbal sludge. But other power shifts were occurring. As art became less a cultural debate and more a form of manufacture for profit, magazines appeared that focused purely on fashionable collecting and lists of “must have” artists, the logical outcome of an overweening market. In fact the most conspicuous characteristic of art writing during the period was its mostly unexamined continuation of its traditional role of promoter and publiciser in an unquestioning alliance with the market. What have all these people and institutions had in common? They have all operated as gate keepers controlling the flow of artefacts and information in a manufacturing and distribution system that was essentially a parasitic growth on the broader activity of human cultural evolution. As neo-liberalism captured this system it re-purposed the arts into a corporate complex not just for adding prestige and legitimacy to wealth, something that has always happened, but also for large scale financial speculation on the one hand and mindless mass entertainment on the other. The weak spot in all such ideological social constructions is the need for gatekeepers and sometimes even the most constantly alert gatekeepers cannot hold back fundamental change of the sort that occurred about the time Art Monthly appeared on the scene. What changed? In the middle of this forty year period there was a major leap in human cultural evolution – the internet was born. Suddenly there was a distribution system that not only gave artists access to world wide audiences at almost zero cost but also did it directly without the need to get past the gatekeepers and rent seekers. The change has been rapid. In 1987 when Art Monthly began publishing, only a fraction of 1% of all telecommunicated information was carried over the Internet. Twenty years later in 2007 it carried more than 97%. And the internet was the perfect medium for an entirely different model of art that had been developing since the 1970s, an art without collectable art works or exhibitions. It mostly grew out of 1970s activism and compromised versions continued to appear in the conventional art world – Haacke and Beuys for instance. It included street art, zines and poster workshops but also artists as cultural activists working collaboratively in groups like the Media Action Group, Union Media Services and BugaUp in Australia and similar groups throughout the world. The most important aspect of this approach is that although it may generate artefacts like posters and publications they are not for the art market, they are produced to create cultural change. In this context any and every thing is cultural media, whether it is an event, a policy document, an interview, an image, a publication or a demonstration and the process is inevitably collaborative. These cultural activists were experienced community builders and therefore already perfectly adapted to the internet environment. In fact the internet and social media, based on open source and open standards software, collaboratively produced and available for free, could be seen as the ultimate outcome of their approach to culture. As far as the art world goes it seems likely that we have undergone one of those Kuhnian paradigm shifts much touted in the late 1960s where everything changes in fundamental ways yet the effects do not become apparent until nearly everyone alive at the time dies – or at least loses their grip on power – because they simply cannot process the insult to their world view inherent in the new paradigm. Although there are endless attempts to simply adapt the existing neo-liberal art world to the internet through websites and online sales or museum exhibitions of the usual suspects advertised with a rhetoric of new media and social involvement, the reality is that the neo-liberal art world is now a blundering zombie, undead but doomed to failure. The gatekeepers cannot pretend to own culture any more when ungraspably fluid cultural activity is flooding around their gates. I suppose here I should define what I mean by failure. I’m a great fan of failure and I’m not arguing that all these institutions are suddenly going out of existence, or that painting, for instance, is finally dead (again). On the contrary, I am simply arguing that the internet will usher in a different age, for better and for worse, where the activities of the conventional art world will continue but they just won’t matter any more. Think of it as like jousting. Once at the cultural heart of medieval society, jousting still exists – in Lithgow where I live we even have an annual jousting festival. But ultimately jousting doesn’t matter and likewise the forms generated by the neo-liberal art meme are already beginning not to matter because they are incapable of playing a meaningful role in the necessary cultural adaptation we must make to survive in a world of looming environmental collapse. In fact they can easily be recognised as an outgrowth of the ideology that is pushing us to that collapse. That is failure. Where does art critical writing fit in to this? Basically, just as slime mould amoeba adapt to stress by grouping together into an apparently different organism and moving elsewhere, so a lot of art writing has moved to the net without actually becoming something new. The early rise of online writing mostly reproduced the newspaper model of exhibition reviews so exactly that the suspicion was always that they were little more than disguised job applications. This approach failed to recognise that they were now writing about the wrong thing. In fact we should no longer talk about art critical writing but rather about cultural critical writing. Dan Hill, whose blog City of Sound was an early starter, rarely writes about conventional art but a recent review for the magazine Domus about the facebook timeline is worth pointing to as an example of the direction that the most accessible critical cultural writing will take. He discusses timeline as interface design but more importantly he discusses the cultural implications of a widely available online tool that will change the nature of human memory in potentially devastating ways by making forgetting almost impossible. The article points directly to what is worth writing about, to the type of artefact like timeline whose designers are now the real artists generating cultural innovation in contrast to the ersatz culture of the art world. And timeline raises another crucial issue, that the internet is a reputation management system where cultural writing is likely to take an entirely different form, closer to conversation and gossip than the supposed objectivity of academic language. Those who do not learn to generate and direct the conversation about themselves will be doomed to obscurity. The significance of an artist is increasingly judged not by reviews but by google ranking and the number of links, facebook friends, likes, twitter followers and who knows what else future technologies will throw up. Shockingly for old players, cultural writing now also means unashamedly writing about yourself. There will be no benefit to false modesty or hiding behind sympathetic critics who you expect will say it for you, far better to regularly blog, tweet and comment far and wide about your latest activity. And that leads to one final aspect, sociability as a practical imperative and writing as the means of generating a supportive community of sharing and linking “friends” that you may never have met. As Marcus Westbury said on April 28 2010 “I just cracked 2000 facebook friends. Who the hell are you people?” Three people liked it, thirty people commented and I know that because I looked it up on his facebook timeline. Thankyou for posting and writing this reflection! I can see how horizontal internet culture-making/social media has moved/is moving us into a place where the lie of objectivity and the truth of self-interest is made more visible. Could this be a bit ‘techno-utopian’ though? i.e. as though there is an authentic self/speaking position (and/or “real artists”) that has been concealed by gatekeepers up til the internet? I’m off to listen to the Vic St squats interview now! I think it probably is a bit utopian. I think whatever happens will probably be no better or worse than what is happening now but it will take a different form, be distributed and sometimes marketed differently and hopefully won’t carry as much ideological baggage as art currently does.